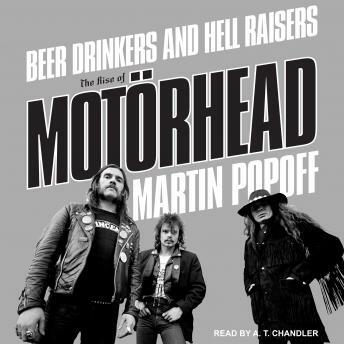 Beer Drinkers and Hell Raisers is the first book to celebrate the classic-era Motörhead lineup of Lemmy Kilmister, 'Fast' Eddie Clarke, and Phil 'Philthy Animal' Taylor. Through interviews with all of the principal troublemakers, Martin Popoff celebrates the formation of the band and the records that made them legends: Motörhead, Overkill, Bomber, Ace of Spades, No Sleep 'til Hammersmith, and Iron Fist. An in-depth coda brings the story up to date with the shocking recent deaths of Taylor and Kilmister. Motörhead comes to life in this book as bad-luck bad boys-doused in drink and drugs, most notably speed-incapable of running their lives right, save for Fast Eddie, who is charged with holding things together. Popoff also examines the heady climate of music through the band's rise to prominence during the New Wave of British Heavy Metal, with detailed reflection on Motörhead's unique position in the scene as both originators and embattled survivors who carried on the renegade spirit of those times.